Appearing on the Wednesday edition of FBN’s Making Money, MRC President Brent Bozell ripped the liberal media and CNN in particular for their advanced case of Trump Derangement Syndrome showing with their “embarrassing” and “insulting” “gossip” about First Lady Melania Trump’s health. On Thursday afternoon, Media Research Center Research Director Rich Noyes appeared on the Fox Business Network (FBN) and exposed the latest double standard by the liberal media harping on various controversies befalling Donald Trump while giving minimal time to the disturbing story about the U.S. giving Iran $400 million when the Islamic country released four captured Americans. Media Research Center President Brent Bozell made his latest Fox Business Network (FBN) appearance on Thursday afternoon’s Cavuto: Coast to Coast and held little back as he called out liberal panelist Richard Fowler for his “preposterous” argument that the need to hype vocal protesters inside the Democratic National Convention (DNC) was much ado about nothing. During an appearance on FBN's Varney & Co. on Tuesday, MRC's Brent Bozell discussed the media's coverage of Donald Trump's immigration comments as well as the docile campaign media's meek acceptance of Hillary Clinton's moving rope line. Media Research Center's Rich Noyes appeared on the Monday, June 30 edition of Fox Business Network's Varney & Co. to discuss the MRC's latest findings about the network news avoiding developments in the IRS scandal. "ABC, CBS, and NBC their evening newscasts did not touch the Lerner email story for seven days," Noted informed guest host Charles Payne. What's more, "it took a congressional hearing where Paul Ryan called the commissioner of the IRS to get them to notice, and then they dropped it the very next morning." MRC director of media analysis Tim Graham appeared on the Fox Business program Varney & Co. on Friday morning to discuss the fading network coverage of the IRS scandal, even though a new poll shows the American people find that to be the most serious Obama scandal. As FNC's Geraldo Rivera appeared in New York City for his Geraldo at Large show on Sunday night to give attention to the Occupy Wall Street protests, participant and music mogul Russell Simmons sparred with FBN's Charles Payne after Simmons complained that his taxes were too low and claimed that his employees pay more taxes then he does. Ed Schultz on Tuesday falsely accused Fox Business Network contributor Charles Payne of recommending people on unemployment lines eat each other to survive. In the current federal tax debate, the media are "really helping out the liberals" just by choosing certain words over others, according to the Business & Media Institute. In an appearance on Fox Business Network Sept. 21, BMI's Julia Seymour told host Charles Payne that the mainstream media - "particularly the cable primetime shows that we looked at," had been framing "the debate as tax cuts, rather than tax increases." Seymour was referring to BMI research showing that the media was using the language of the left and the Obama administration when reporting on the tax issue. MSNBC's Keith Olbermann said on Sept. 13 that "Democrats want to cut everybody's taxes," despite the president's stated intent to raise taxes on the rich. "It was 27 tax cut-framed stories, versus two tax increase stories," Seymour told Payne. The media were thus 13 times more likely to put a positive spin on the Democrats' intentions than to characterize the move as a tax increase. 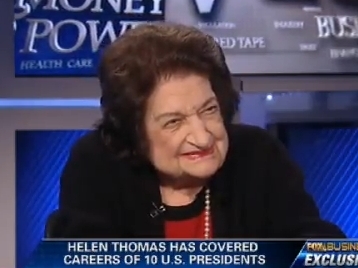 Helen Thomas on Tuesday not only admitted that she was a liberal, but also claimed she's as far left as you can go. Chatting with some of the folks from the Fox Business Channel, the long-time member of the Washington Press Corps also said Barack Obama ISN'T a liberal: "Not in my book." Thomas also felt the President isn't beating up enough on corporate America: "Poor American business, what the hell have they done to us now? The whole country's in shambles."